I am making Greek barbecued lamb for Easter and I wanted a Greek starch side dish. Found a recipe for Spanakorizo (Greek Spinach and Rice). 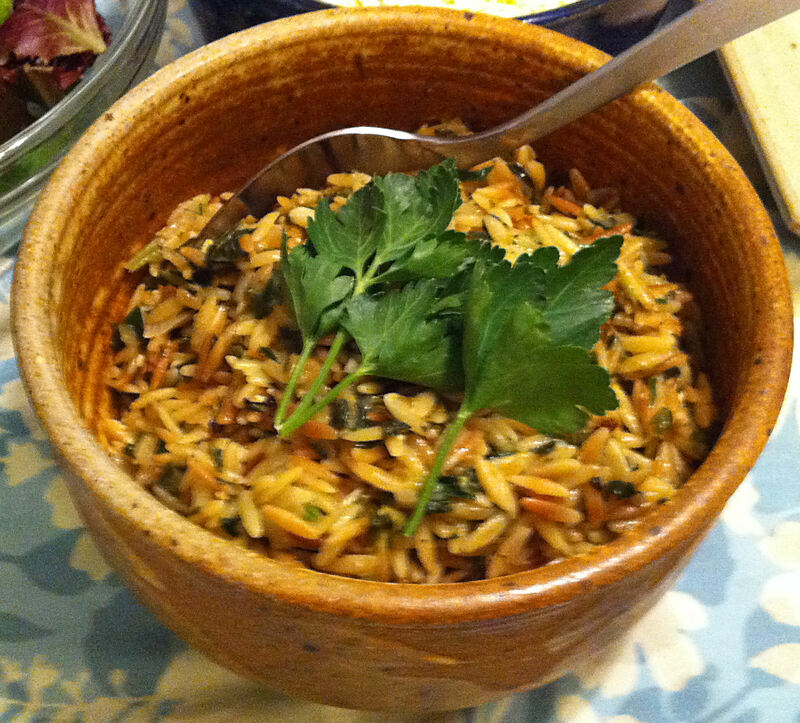 While I did not copy the recipe, it gave me the idea for a Greek-style pasta dish with orzo. 1. Sauté the onions in a medium sauce pan with the olive oil and salt until soft, about five minutes. 2. Add the orzo and continue sautéing, until the pasta is well browned and the onions are picking up some color. 3. Pull the pasta and onions to the sides of the pan and add the garlic to the hole in the center. Sauté one minute until fragrant. 4. Stir in the pepper, spinach and broth. Tip: If you would like less of the harsh spinach flavor, blanch the frozen spinach, and squeeze it dry, before adding it to the pot. This will also prevent ending up with too much liquid in the pot for the pasta. Soggy pasta, bad. 5. Bring the pot to a boil, reduce the heat and cover. Simmer for 10-15 minutes, until the liquid has been absorbed. 6. Remove the pot from the heat and let it rest, covered, for ten minutes. 7. Stir in the feta cheese, two tablespoons of the parsley, and the lemon juice. Let the pot rest two more minutes, covered. Tip: If the pasta is clumping together you may stir in one tablespoon of olive oil. 8. Transfer the pasta to a serving bowl and garnish with the remaining parsley.